A few weeks ago a couple of colleagues and I decided to pay a visit to our friends at Mindego Ridge Vineyard up in the Santa Cruz Mountains. Before our visit we took a hike in beautiful Pescadero Creek Park, filled with some of the largest redwood trees in California and, of course, many banana slugs. If you’re ever in this neck of the woods, I highly recommend taking the time to hike around. After our hike we continued up windy Alpine Road to Mindego Ridge. At the front gate of the property you’d never even guess that there were grapevines there, as the vineyard is quite hidden, especially with the socked-in fog that was present that day. We were greeted at the main house by David Gollnick, the owner of the vineyard along with his wife Stacey, who together are the only full-time workers on the property. Mindego Ridge consists of 40 total acres with only 10 acres planted to Pinot Noir and Chardonnay grapevines. The vineyard is surrounded by redwoods and is very close to the Pacific Ocean and San Francisco Bay, creating a cool vineyard mesoclimate that makes for expressive, elegant, vibrant wines. The vines are dry farmed, a practice David implemented two years ago. 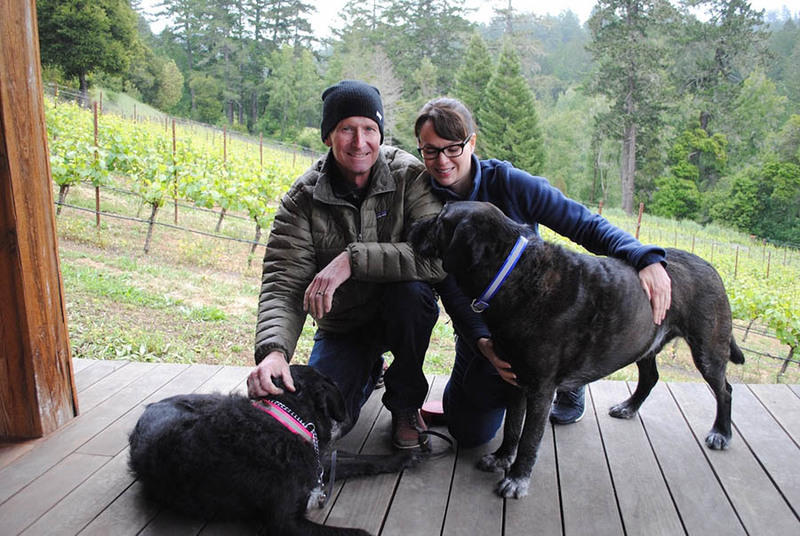 Their wines are made from 100% estate fruit and made off-site by renowned winemaker Ehren Jordan, who has had a handful of winemaking gigs—most notably Turley Cellars and Failla—and now consults with Mindego Ridge for their Pinots and Chardonnays. After a vineyard tour we made our way to the Gollnick’s newly built outdoor bar were we tasted both the 2015 and 2016 vintage. The 2015 vintage suffered a cool May which led to less than half of the vineyard’s normal yields. Nonetheless, the Mindego wines that came out of that year are fantastic, with a lot of concentrated flavors, bright acidity and fine structure. The Chardonnay was creamy in texture with concentrated flavors of honey, citrus and spice. The 2015 Pinot was one of the favorites in the lineup with high-toned red fruit and great minerality on the mid-palate. Unfortunately there will not be a ton of 2015 to go around, so once these are released, you’ll have to act fast! The 2016 vintage was back up to normal yields and as good as ever. The Chardonnay was a bit brighter and crisper than the previous year and had a great expression of its site. The 2016 Pinot was very expressive with red cherry, raspberry compote, cola and that great acidity that is a constant with all their wines. Currently, we have Mindego’s 2014 vintage available. The 2014 Mindego Ridge Santa Cruz Mountains Chardonnay ($44.99) is fantastic, with aromatics of pineapple, melon, mint and minerality with a full, rich body. It was aged in 75% neutral oak, 15% new oak and 10% stainless steel. The 2014 Mindego Ridge Santa Cruz Mountains Pinot Noir ($44.99) is just as great with classic Santa Cruz Mountain dark fruit flavors accompanied by spice and herb notes. This drinks really well now and can be enjoyed over the next five years or so. From tasting all these vintages it is clear to see that Mindego Ridge is a special site that should certainly be on everyone’s radar. It was an absolute pleasure meeting the Gollnicks with their sweet dogs Larry and Bunny, and getting to know the faces behind the brand we sell here at K&L. Pick up a bottle for yourself in our shop or online. If you’re in the area, stop by their tasting room in Saratoga, California.